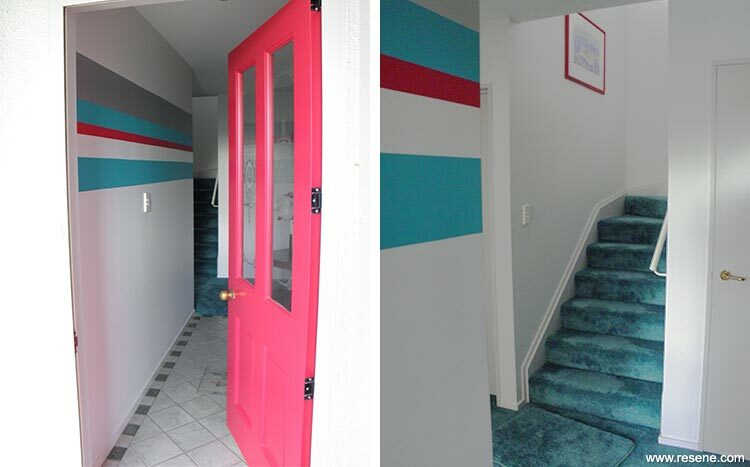 This 20 year-old two storey townhouse needed a new colour palette. The interior colour scheme and theme would also be the scheme for the exterior of the house, including the garden courtyard and fencing. A total repaint was needed inside and out. All bathroom and kitchen fixtures, plumbing and furniture is in good condition and was to remain. The significant pieces of existing artwork were to be incorporated, two quite recently purchased, and two other pieces would be purchased with the new scheme in mind. Established trees are a large part of the urban landscape featuring pleasant homes of melding ages and designs. The property is built into the lower slopes of the north–east of Cathedral Hill and those beautiful trees and gardens shelter this property from southerlies. The front door opens into the ground floor passage which gives access to the garage, second and third bedrooms, bathroom, toilet, and the stairway to the first floor, where the living area opens up ahead featuring angled walls and an excellent use of space. Western sliding glass doors, accessing a deck which runs along the western wall, and large windows are directly ahead. To the right is the dining area and then right again to the kitchen, both having large eastern windows. The dining area windows are floor to nearly-ceiling height and have been constructed in a bay style. To the left of the upstairs entry zone is the door to the master bedroom, then further left to the laundry, the glass back door, and then round to the hot water cupboard. The back door leads out onto the garden area at the rear of the section. The master bedroom is located on the south-west wall of the first floor. It has a private sun room interior-courtyard to the west accessing the outside deck. Through this sunroom is the access of sunlight into the bedroom. The guest bedroom downstairs has a compact courtyard outside sliding glass doors. As it is located on the south of the house and sheltered by the top story it is ideal as secluded fernery against a retaining wall with the next property. The other ground floor room has eastern windows and north-west sliding glass doors opening into the courtyard. This room is used as a business studio. 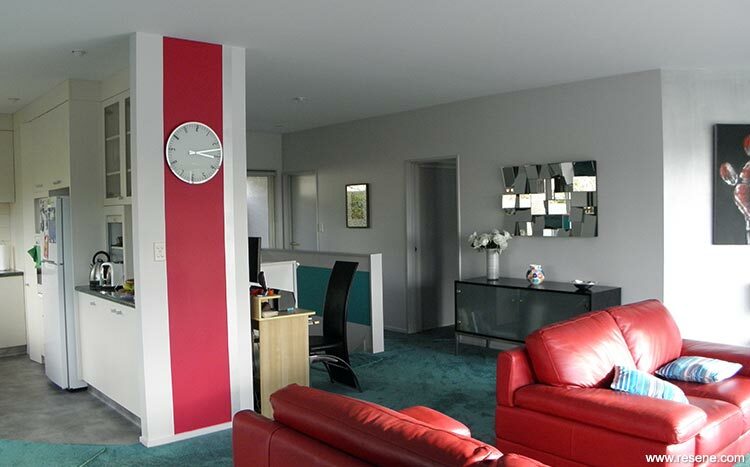 The existing colour scheme was the original, dated and not in keeping with the owner’s personality at all. The new colour scheme needed to relax and refresh the serene and peaceful aspect to the owner’s character; a combination of colours that could be loved for many years to come. The setting and style of the building were also very important to consider. There are many simple yet effective architectural extras in the design of this home, and the large airy and sunlit areas offered a challenge in the way the light was reflected around the living areas. The two bedrooms that had restraints on their natural lighting also had to be taken into account. Resene Rakaia gave an enduringly sophisticated yet unpretentious tint and shade palette. Used in quarter strength, Resene Quarter Rakaia, this is a complex ‘grey’ giving excellent light use properties, warmth where needed, coolness where needed, gentle peace when required, quietly exciting prospects when encountered. 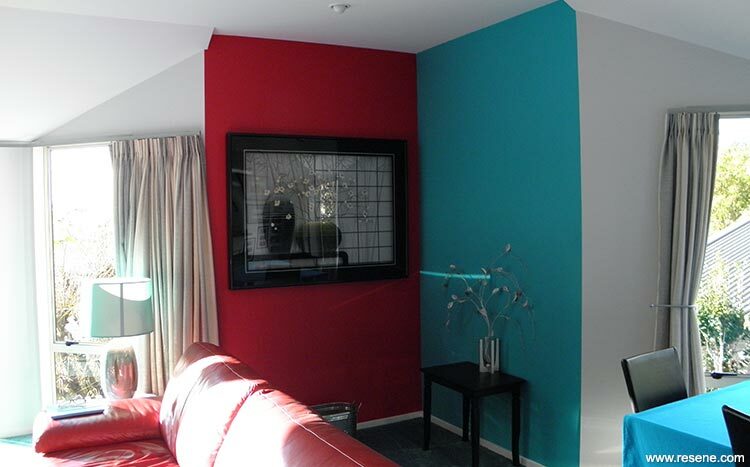 This was combined with Resene Black White on the ceiling and Resene Rakaia on doors and window frames. As the light and time of day affects this colour range throughout this house it continually delights in the colours achieved. It works very well with the existing colours and furnishing. The use of Resene SpaceCote Low Sheen in Resene Hullabaloo and Resene Rock N Roll, and Resene Enamacryl Metallic in Resene Silver Aluminium as features and accents adds controlled and balanced excitement, nurturing the juxtaposition of stimuli and warm peace desired. A bold Resene Rock N Roll front door welcomes in guests and hints at the pops of colour awaiting inside.